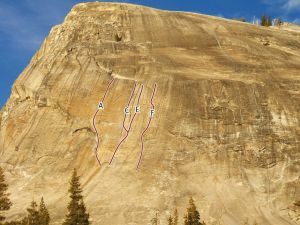 More shallow and slabby than its neighbor, the Right Water Crack is somewhat harder and more of a slab climb. A couple of bolts can be clipped from either crack. Which SuperTopo guidebooks include a topo for Right Water Crack?